It’s not quite cinema-dark inside Enza, but it’s not far off. 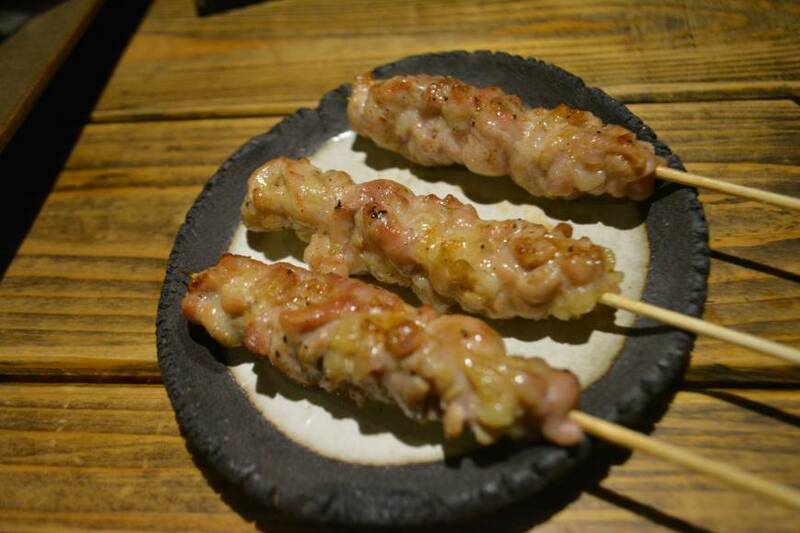 Indeed, the cinema connection is apposite: In many ways Enza is as much about yakitori as it is about icons of American cinema. Framed movie posters line the walls, but the best room in the house is the bathroom, which is an homage to director Jim Jarmusch, whose entire filmography is framed and hung on the walls. Besides the aesthetics, there’s plenty to enjoy from the kitchen, which has a charcoal grill. I started with a chef’s choice salad, a colorful arrangement of endives, zucchini, Chinese radish and tiny currant tomatoes that could fit inside the mouth of a goldfish, all anchored by a lovely anchovy dressing. From the charcoal grill we had a few of the staples, including tsukune (minced chicken skewers) sweetened with a drizzle of soy sauce glaze. 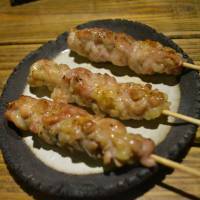 At Enza they forego the egg yolk, which often accompanies the tsukune, and as much as the rich yolk is a source of protein and umami, I’m OK with the tsukune flying solo, so to speak. Also worth ordering is the negima — chicken bits interlaced with leeks and once more sweetened with soy sauce. There’s more to bite into with the negima as opposed to the tsukune. The bacon, wrapped around mini tomatoes and asparagus, disappoints, but much better is the aka niwatori momo yaki: bites of chicken thigh served piping hot on a bed of onions, mixed with garlic and citrus sauce. Jim Jarmusch and yakitori is a oddly pleasing mix, and one the American auteur would probably dig.